113th day of the year. There are then 252 days left in 2019. 35th day of Spring. There are 60 days left till Summer. April 23, 2019 is the 4th day of Passover (Jewish Observance). One year ago, a senseless attack took the lives of our neighbours, friends & fellow Canadians. Toronto faced this tragedy with incredible strength, & an entire country came together to show the true meaning of community. Together we remember those we lost & remain #TorontoStrong. 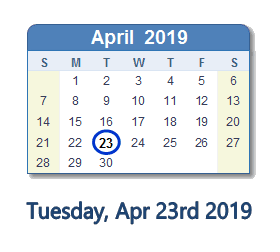 What happened on April 23rd 2019?